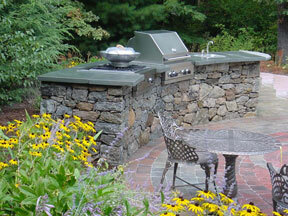 At Hopkinton Stone & Garden, Inc., we cater to landscape contractors and homeowners who have projects to complete. We can custom order your pavers, stone, and hardscape materials for quick pick up at our garden center in Hopkinton, MA or directly to your job site. Flagstone for walkways and natural stone patios. Cobblestone available in many colors and sizes. Bluestone: Multi-color, Blue, Thermal and Natural Cleft. Treads and steps are available. Travertine and Granite stones are available in many colors and sizes. Treads, steps and pool coping. Large Garden Steppers for natural steps and paths.